– You will also need disposable wooden skewers. – Cut pork into 2 inch x 2 inch cubes & marinate overnight in 1/4 cup La Choy Teriyaki Stir Fry & Marinade, and 1 teaspoon of minced garlic. 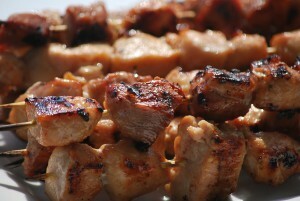 – Place pork cubes on disposable wooden skewers. – Remove from grill, allow a minute to cool, & serve. – Partially skin 2 cucumbers, slice thin, discarding middle portion (seeds), & chop each piece into thin strips, (~3 inch strips). 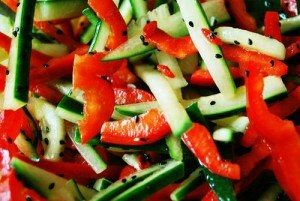 – Slice 1 red pepper into thin strips, (~ 2 inch strips). – Place vegetables into a salad bowl, add 2 tablespoons olive oil, 1 tablespoon red wine vinegar, and toss. – sprinkle a teaspoon of black sesame seeds, and a teaspoon of Dulse Flakes onto vegetables & toss again. – Squeeze fresh lime over the salad. – Serve with the Grilled Teriyaki Pork Skewers. This easy-to-prepare & easy-to-cook meal with an Asian flare is perfect for Summertime barbecues & a great idea for Father’s Day! Portions: Women- 3 oz. of Grilled Teriyaki Pork & 1/2 of the Summer Salad, Men: 6 oz. of Grilled Teriyaki Pork & 1/2 of the Summer Salad. I’d just like to add a few notes about some of the ingredients as well. I chose La Choy Teriyaki because it’s the lowest in sugar & sodium out of the many Teriyaki sauces that I looked at. It truly complimented the meat & created mouth-watering morsels that I really enjoyed eating! So delicious! Also, the Dulse Flakes are rich in iodine which has been stripped from much of our foods, & is a vital nutrient for healthy thyroid function. And last but not least, the black sesame seeds provide a great source of calcium and magnesium, and help to lend flavor that completes that Asian fusion taste that I was going for in this meal. I hope that you enjoy this one as much as I did.